It is a little bit much at first. So here’s a quick-start guide to what all this stuff is, what it’s for, and how to stock up without breaking the bank. Paleo treats are treats. They’re meant for special occasions, not for eating every day. If your food log is full of Paleo cookies and Paleo pie and Paleo brownies, then you probably need to pay a little more attention to following the spirit of Paleo. To substitute for wheat flour and refined sugar, Paleo baking uses a variety of different ingredients. Some flours are made of nuts (e.g. almond or cashew flour); some are made of other things (e.g. coconut, sweet potato, or plantain flour). 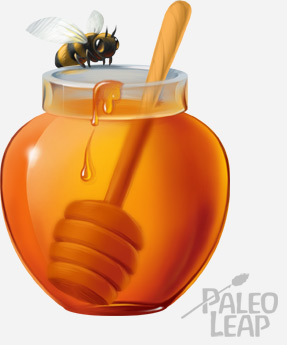 There’s also a whole array of sweeteners replacing refined sugar: honey and maple syrup are two of the most popular. 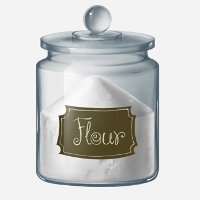 A basic flour. Almond and coconut flour are the most popular and if you have one of those two, you’ll probably be able to find a recipe for whatever you want to make (here’s a guide to choosing which one you like). Having both is a good idea if you want to get serious about baking. Some kind of sweetener: pick one or more from honey, maple syrup, coconut sugar, date syrup, dates, fruit juice, and/or any other sweetener you prefer. No one sweetener is obviously superior to any other; what’s more important is limiting the total amount of sugar in your life, whether it comes from “natural” sources or not. Chocolate: 100% cocoa powder, plus the darkest dark chocolate you can enjoy (the darker, the healthier; go for at least 85%). If you are on an autoimmune protocol, you can substitute carob. Nut butter (your favorite kind; just remember that peanuts aren’t nuts and they aren’t Paleo, so neither is peanut butter!). Coconut butter or sunflower seed butter would be good alternatives for nut allergies. Unsweetened coconut flakes: these are often used to create a kind of chewier “oatmeal cookie” texture, or to add a topping to cupcakes or donuts. You’ll also be using ingredients you already have for non-baking purposes, like eggs, coconut milk, salt, fresh fruit, and raw nuts. Paleo chocolate chip cookies (Primal Palate). Flour: almond. Sweetener: maple syrup. Paleo brownies (Paleo grubs). Flour: none. Sweetener: maple syrup. Paleo chocolate cupcakes (Elana’s pantry). Flour: coconut. Sweetener: honey. Almond banana chocolate chip muffins (Multiply Delicious). Flour: almond. Sweetener: none. Almond and coconut macaroons (Paleo Leap). Flour: none. Sweetener: honey. Other flours: experiment with potato flour, plantain flour, tapioca flour…Each one has its own texture and many more advanced recipes combine them in different proportions to get the right effect. Fancy finishing salts or special sea salt. If you do dairy (not everyone tolerates it), also don’t be shy about playing around with cream, butter, or cheese. Pick these up one or two at a time as you feel like experimenting with them; it keeps the cost down and helps avoid getting stuck with a bunch of special ingredients you don’t even like and don’t know how to use. Paleo fruitcake (Paleo Leap) – go crazy with the dried fruit mix-ins! Fudgy brownies (PaleOMG) – with figs. Chewy turtles cookies (The Healthy Foodie) – there’s a vanilla bean and three different kinds of flour. Chocolate donuts with coconut vanilla bean icing (Running to the Kitchen) – put coconut butter to good use to make the icing on these donuts. Orange vanilla crescent cookies (Paleo Crumbs) – test out that orange extract. A kitchen scale. Weighing ingredients is much more precise than measuring them. If your baked goods are constantly coming out either too dry or too wet, there’s a good chance that it’s because your measurements are somehow off (maybe your flour was too packed down, or too fluffed up, so you got too much or not enough in “1 cup” of flour). A double boiler (for melting chocolate): if you’re going to be doing any kind of chocolate sauce, caramel sauce, or equivalent goodies, you might want one. A stand mixer (for beating eggs, mixing batter, and generally making your life easier). Ramekins (for crustless pies and cakes): a lot of Paleo adaptations of pies and cakes simply keep the filling and leave the crust – you can make personal-sized variations in little ramekins. And now for just a few do’s and don’ts when it comes to working with Paleo ingredients. DON’T substitute one kind of grain-free flour for another unless the recipe specifically says you can. Coconut flour is especially notorious for messing things up if you try to swap it in for a nut flour. DON’T assume you can use the same baking temperatures that you would for the equivalent grain-based recipe. Many nut flours burn more easily and need a lower cooking temperature. DO play around with flours and sweeteners until you get one you like. There are so many options out there and the variety is increasing every day. Once you start experimenting with making recipes on your own, you’ll get a much better feel for what works and what doesn’t – you’ll even start being able to come up with your own creations!